Good morning! I spent the weekend doing a bit of sewing, but also doing a few final jobs in my sewing room, to the point where I think I can call it ‘finished’. I thought I’d share a little room tour, since I always love seeing where other people sew. This room has been a long time coming… it’s always been a multi-purpose sewing room, study, and occasional guest room, but a few months ago we knocked down a wall that separated it from the corridor leading to the back door. The extra 12 or so sq ft made a world of difference, and while having the back door lead right into a room isn’t ideal it did have the benefit of adding another natural light source to the space. My keyword for this room was basically STORAGE. To that end, I did a lot of shopping in Ikea and Muji, and had a custom desk and shelving unit made by a local carpenter. It’s so nice to finally have a desk big enough to have both my machines out together – before I would be lifting one of the way to work with the other. I’m asked fairly often, by the way, what machines I use – a Janome DC 3050, and a very old Toyota overlocker. My sewing machine sits on a silicon baking mat – great to prevent slips and skids and cut down on noise! I made the mat under my overlocker, which is even more cushioned and great for sticking pins in. The shelves above the desk use up some awkward alcove space and hold my main fabric stash, which these days I’m trying to keep quite small (I’m basically at full capacity now). All the fabric is wrapped onto mini ‘bolts’ – actually comic book backing boards. I honestly didn’t think I’d be able to keep this up long-term but seeing my fabric so tidy and unwrinkled when I want to use it is a big motivator to keep things ship-shape. I picked up the vintage spools from Brooklyn, they are perfect for wrapping trims around. Lint rollers an essential for threads and cat fur. I try to keep the desk surface as clear as possible: I find that stuff has a habit of flying off the sides as you’re moving fabric around and losing your unpicker all the time is really not fun. So I pushed everything onto wall shelving – this unit, the pegboard and my trusty sewer’s friend, the Ikea Raskog trolley. 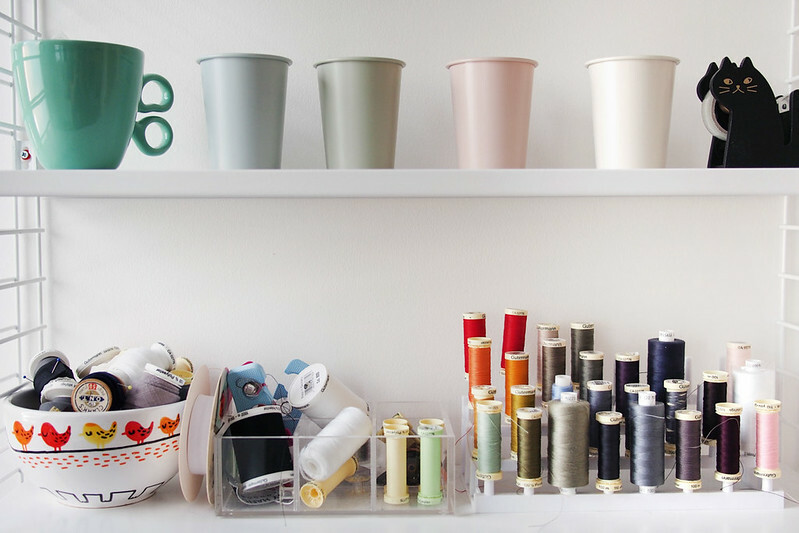 Thread rack from Amazon and yet more Muji cups and storage. I save old spools and use them to keep loose bits of bias binding organised. Over on the other wall is the guest bed (an IKEA Brimnes), which as well as trundling out to a double size also has very handy large drawers underneath. They’re obviously stuffed full already – bulky stuff like quilt wadding and those boring alterations projects I keep putting off, mostly. 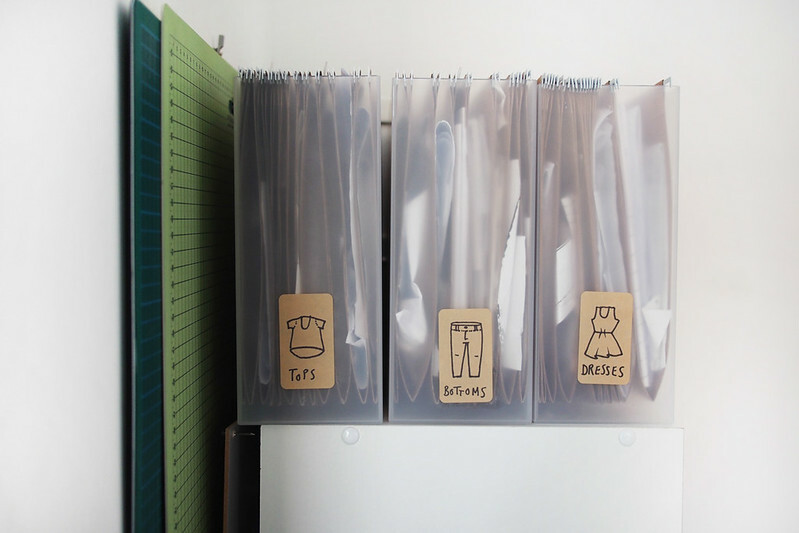 This is my pride and joy – Muji vertical files to hold frequently used PDF patterns, sorted by garment type. It works so well! Muji PP drawers under the desk hold printed patterns, and the binder on top is PDF overflow. The iron and board live behind the door. I make my own covers and change them whenever they get tatty (ie this one soon) – current fabric is from Miss Matatabi. Phew, that turned out quite long for such a small room. 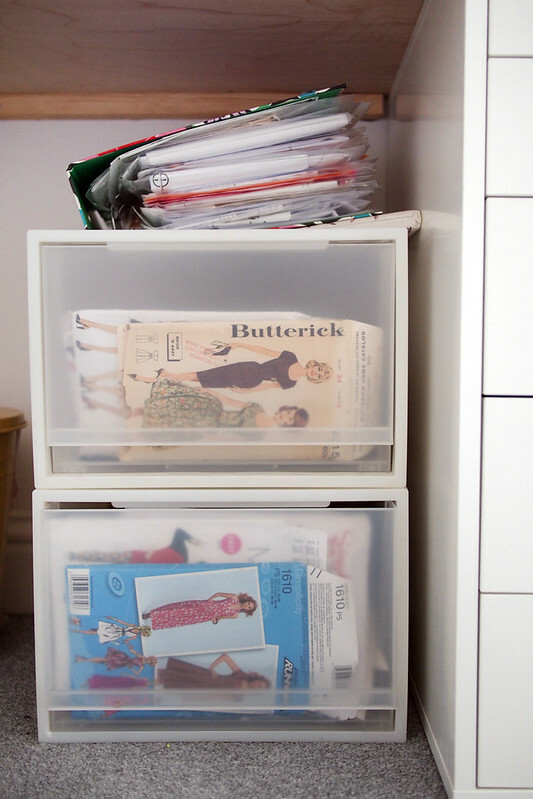 Here are some quick tips I’ve amassed that help me with staying organised in my sewing space. > Use vertical space effectively: tiered trolleys, wall shelves, hooks and pegboards hold a ton and keep floor space free. > Give everything a dedicated home, ideally away from your main sewing surface. Keep regularly used stuff closer and organise lesser used stuff accordingly. > Tidy up between sessions. Yup, even though I’m lucky to have a dedicated space and can leave things out, I do tidy everything away when I’m done sewing for the day – putting tools away, cleaning the carpet of threads, stashing leftover scraps. It’s much easier to find everything easily when I pick up next time and means you avoid that off-putting bomb-site effect when things get out of hand. > Clear out regularly. Perhaps as a result of doing the Konmari method, I get a bit stressed when I have too much stuff hanging around. I’ve got much better at keeping my stash in check, both at the buying point and getting rid if I feel I’m unlikely to ever use something. That applies equally to fabric yardage, scraps, patterns, tools and notions: use it (or have a plan to use it) or lose it. oh it’s lovely. good to see how you have organised your space. i’m about to turn a v v v tiny utility room into a sewing space so storage ideas are always welcome. 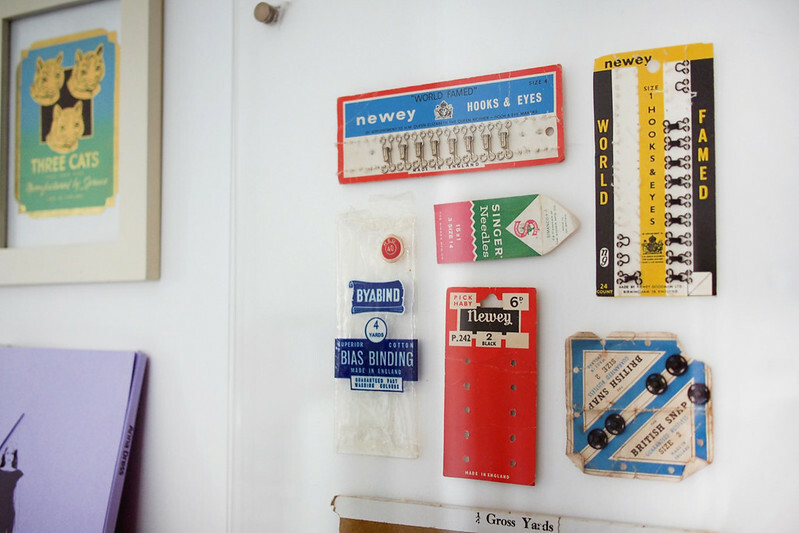 i like the pegboard for scissors – i was planning to use some for a thread storage rack. Oh exciting! I think you can expand or contract to fit any space you have spare – definitely max that vertical space. What a nice sewing room! 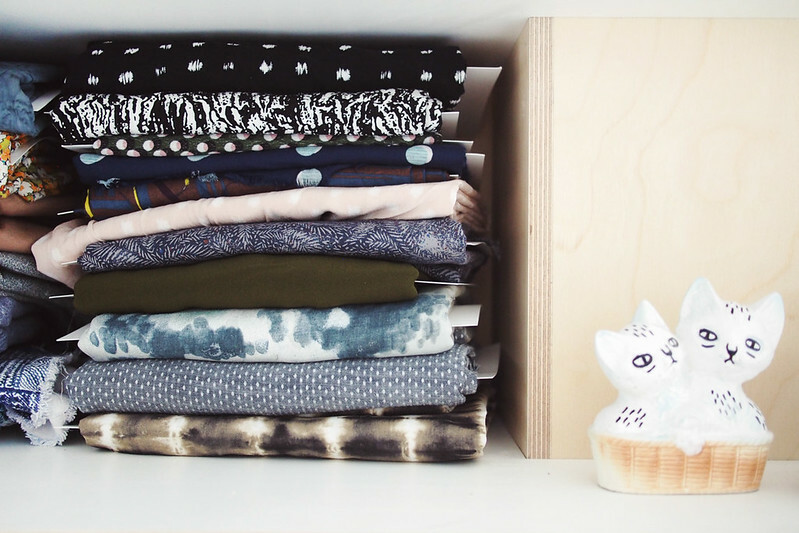 I like your well organized stash of fabric and patterns! It is a very good idea to gard spools for wrapping bias bindings around. I try to tidy up my space after sewing, too. I don’t like to begin doing anything at a messy space. Thank you for showing us your beautiful place and have a wonderful time in there! Absolutely, a tidy space makes everything go better I find! Wow! Very organized space-love it! So light and tidy! Sigh….. I’m so messy. Not pictured: the bombsite that is the rest of my flat. This is my little house-proud corner! What a great space, Katie! You’ve definitely made the most of what you have. Living in a 500 sq ft condo, I feel your pain on maximizing a small area. 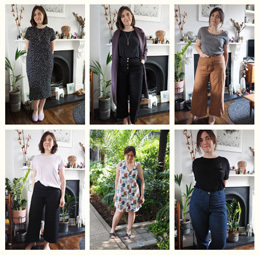 I agree with getting rid of what you haven’t used – if I haven’t used it, cleaned it or taken care of it in 6 months, I get rid of it, even if that means trashing good fabric (I sometimes give it away). Of course, there are exceptions to those rules (i.e. vintage), but generally, that’s the case. I try to live as simply as possible and only with the necessities. Our whole flat is about 750sqft for two people and two cats, and it’s about 50% useless hallway. I’ve thrown out so much and there’s so much still to go! Wow, love the room! So bright and colorful! I’m drooling at the sight of all your patterns–my collection is still growing for sure. 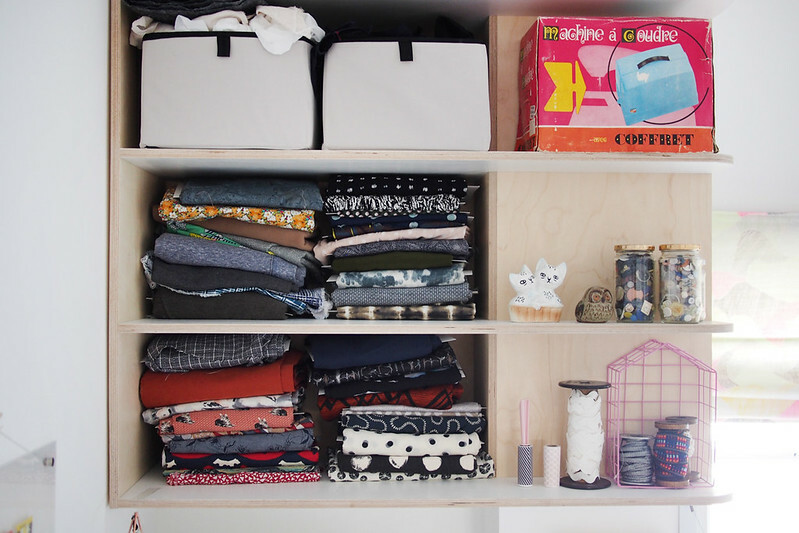 Everything is so tucked away and tidy….unlike someone’s sewing room I know (aka mine) but you inspire me to keep my room clean. Your room is amazing! Such great light for taking photos with too! I am however very glad I’m not the only one who’s sewing room is a bedroom. I bet you don’t want any guests to stay so you can work. Ah so so jealous, what a beautiful sewing space. I especially love the desk…such a good idea to get it hand crafted. Oh and the light is beautiful! I love it.Just pinned to use as inspiration once I move. My current sewing room is huge, but really odd shaped so you can’t really fit a little couch, which is all that’s missing. Thanks for pinning! I love to hang out on the bed in mine, so a couch is a good idea. That’s so cool that you share a space! Sewing often isn’t so sociable. Thanks for the tour, Katie! I like seeing inside other people’s sewing spaces too. I use a lot of the same storage methods as you but I think I could learn quite a bit from your modest fabric stash!!! 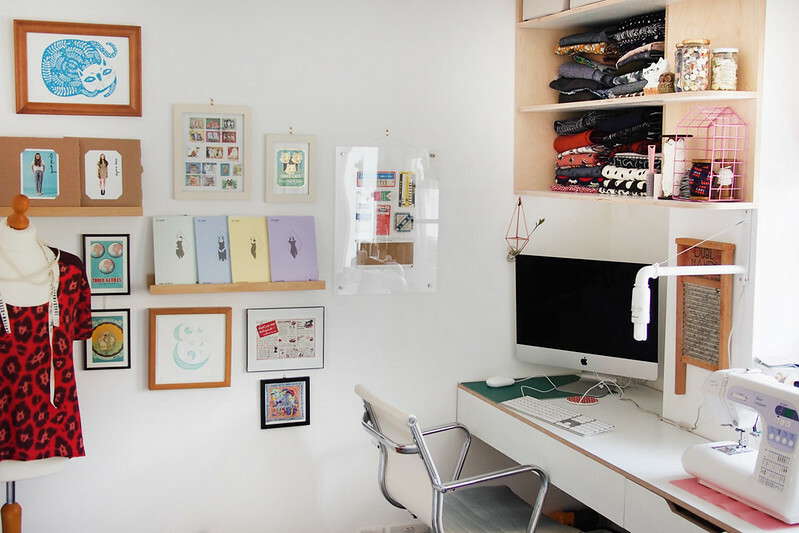 Ok I want this room in general but I NEED that PDF pattern filing system from Muji! I’m literally going to look it up right now! 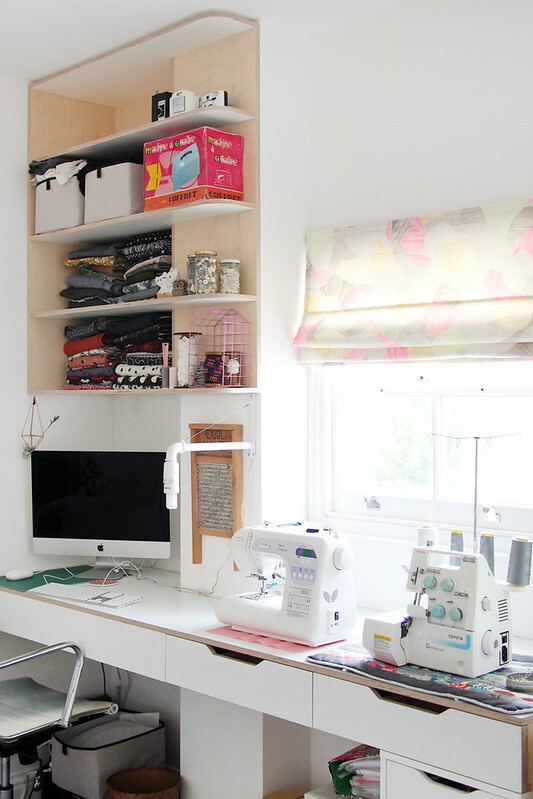 Ahhh your sewing room is awesome!! 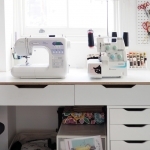 I really love seeing other seamstresses sewing spaces. I need to make a couple trips down to Ikea soon, as I need to reorganize my space! Really interesting post – thank you. Very jealous! What an awesome room! It looks super functional and almost TOO well organized. ;) That Muji file system looks like something I need… my PDFs are outrageously unkempt! I get a weird sort of joy out of tidying everything into its proper place now, such a dork. Well, I am so inspired. Honestly, I was about to weep in agony this weekend as I surveyed my messy space. I *LOVE* the way you thoughtfully use each square inch of your space. And the light in your room seems so perfect. I sew in a basement room so securing better lighting is high on my list of priorities. Thanks for showing a slumming girl like me, How Its Done. Enjoy! It was a learning curve for me, I am naturally quite messy, but I LOVE keeping this room tidy! I have a daylight bulb over the desk for after-dark sewing, it’s pretty good. Wow, your new space is amazing! 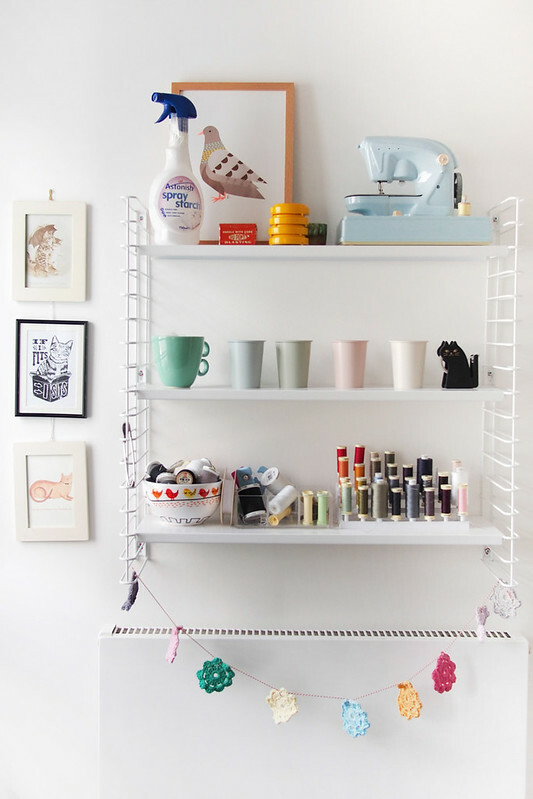 Lots of clever storage ideas, which I might steal as my space is a corner of the living room! 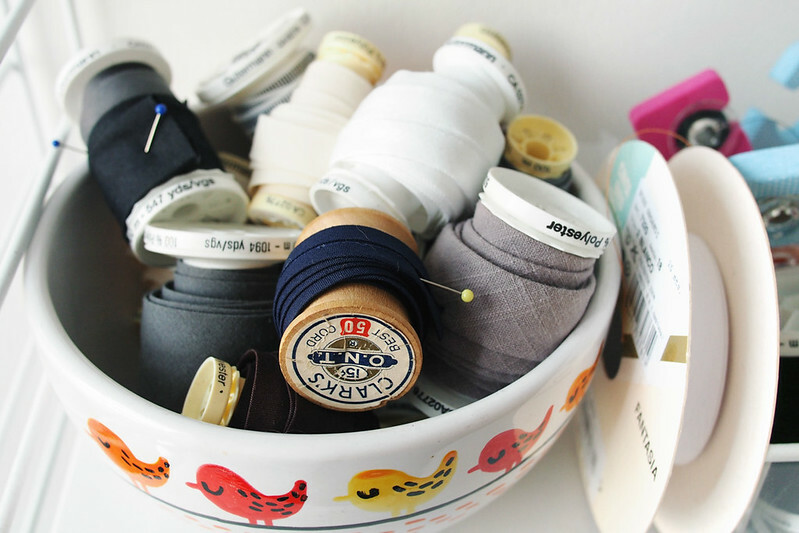 Storing binding on old spools is, quite simply, genius – I will definitely be stealing that idea! Works a treat, you can secure them with a pin or a bit of masking/wahsi tape. 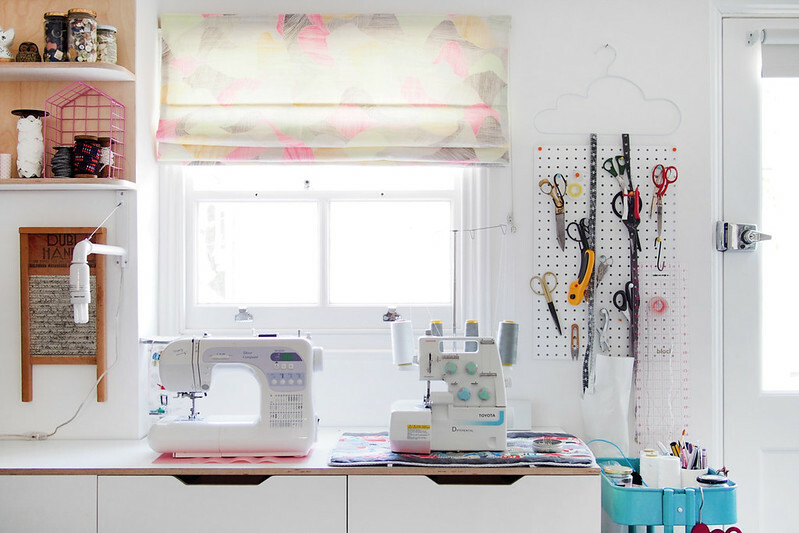 Your sewing room is so lovely! 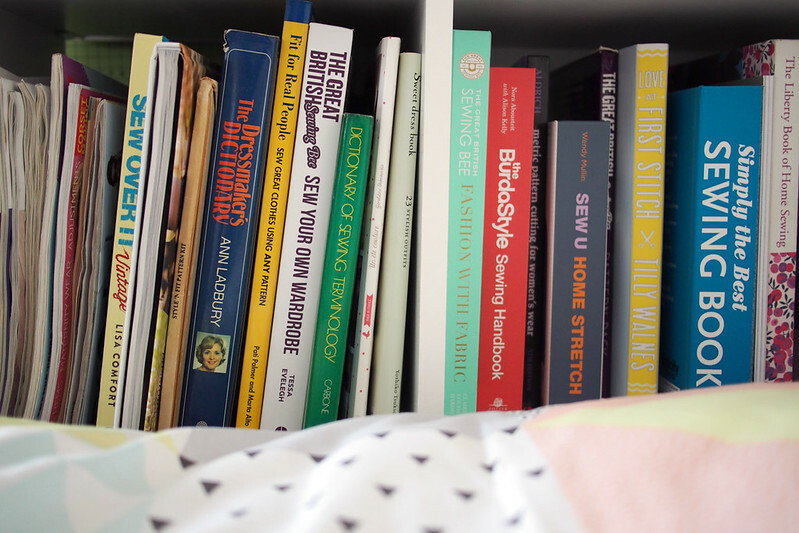 I love checking out what other people’s spaces look like too–thanks for sharing. Quick question–do you fold your PDF patterns to store them vertically? I currently have mine hanging on my wall, but I’m looking for a new solution. Yes, typically I trace them onto lightweight dot-and-cross paper and fold them to fit into the binder. They hold up quite well. I’m loving the use of space, and touches of colour. The lighting looks great too. You must be really proud. I’m a graduate so I’m leaving all the space of a double long desk, possibly even my sewing machine for the 4th summer running (this always has to go into storage as its difficult to move around with). I miss having the space and ability every time I want to sew or do a project, rather than just planning one. This is something I’m going to be daydreaming about till I can have the space I want to sew. Your workspace looks so pretty! Thanks! I definitely miss my space and machine when I need to travel. I found over the years that it is impossible to cram a pattern back into the original envelope, for years I cut them out and put them in the large zip-lock freezer bags with the photo facing out. 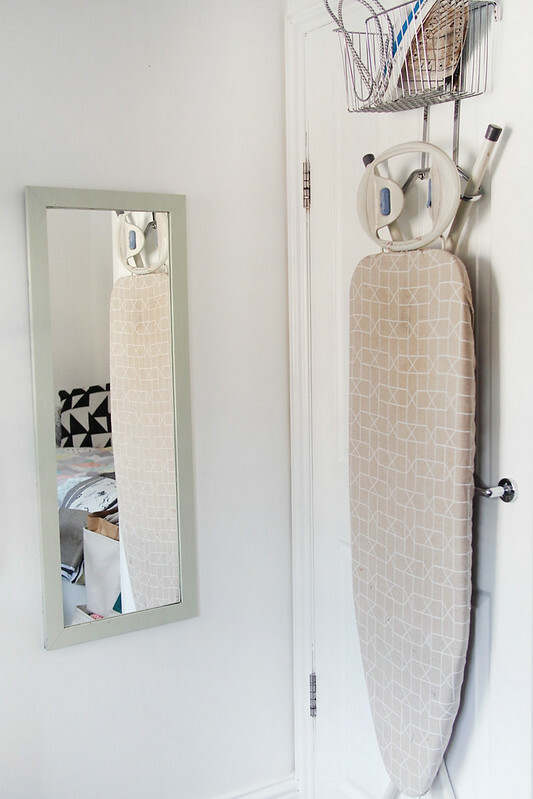 This keeps them from getting wrinkled up, torn or lost. I use an old milk crate to stand them up in. I love the peg-board idea for scissors and things. I inherited a very nice craft table from the mother-in-law when she passed, I love it for cutting out fabric and it is the perfect gift wrapping station at Christmas. It has “wings” that fold up for use and when folded down uses very little space. When I use it I use tall bar stools so I don’t have to stand up the entire time. Also the craft table has storage on both sides for me to hide my fabric stashes. My husbands mother always sewed, so he doesn’t fuss when I see fabric I just have to have….even when I have yards and yards tucked away everywhere. He thinks it’s normal, wink, and I will never tell him differently. Some great tips, thank you. I like to sew standing up as well, my desk is a bit too high for my old chair at the moment. I’d love a winged desk! Looks lovely Katie! A very inspiring, bright and happy space. 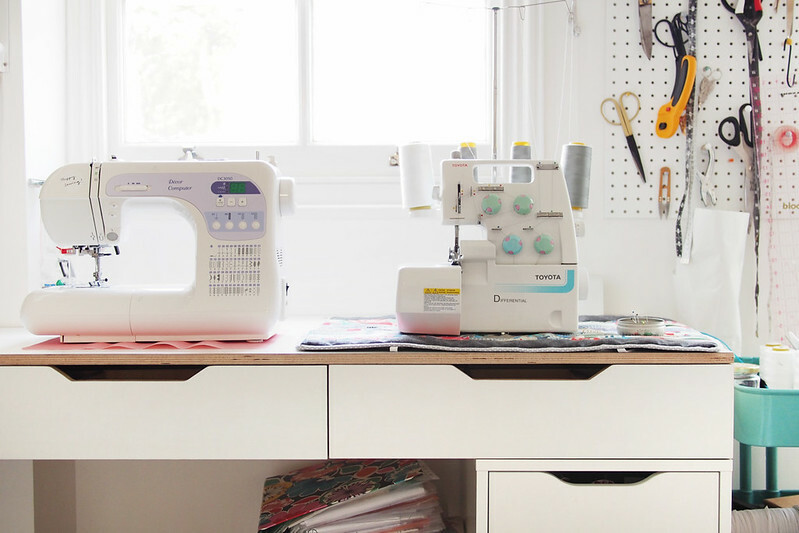 I’m pretty good at tidying up my sewing mess at the end of the day, but dream of one day having a long desk where I can leave my machines out – good call! 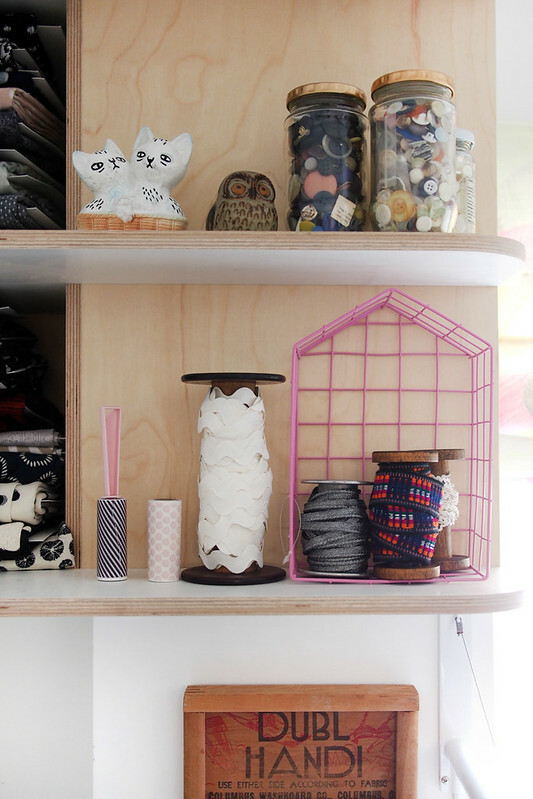 Your sewing room is gorgeous and I’m going to be stealing so many of your ideas! Thank you for sharing it. Did you stick something onto your cutting mats to make them hangable? I’d really like to be able to hang mine up. At the moment I wedge it down the back of my cutting table and then I have to wait for the inevitable bump to flatten out when I want to use it again. 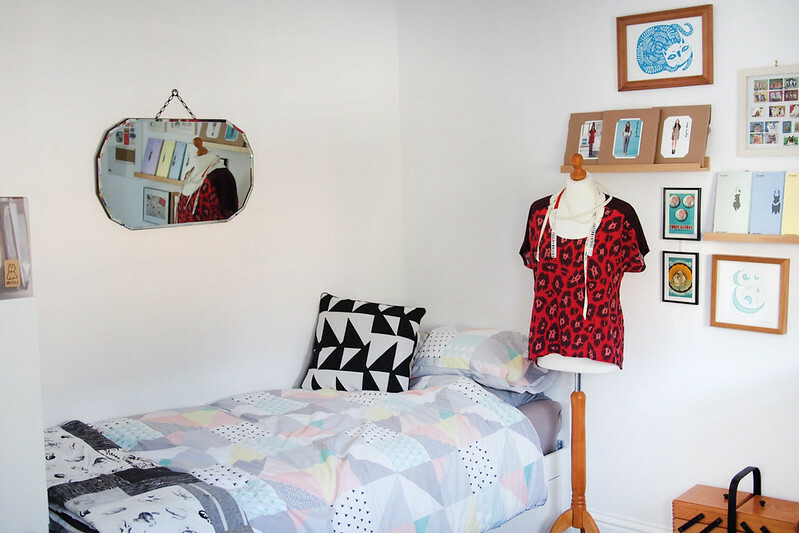 Love your sewing room, I have space envy :) I found an even better diy fabric storage bolt recently, poundland sell a flat A4 artists canvas which are even better than the comic card especially for larger/heavier fabrics! Ah yes I know the type, they would work well! Wow! What a great space and I love all that natural light. You are so organized! I strive to be this organized! 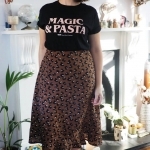 Thanks for sharing – I love to see where people sew. The organisation was a learned behaviour definitely, not my natural state, but I love it! Oh it’s so light! There’s no natural light good for sewing in our apartment, only a big bay window for a few photos in my bedroom. But! We’re not in Shanghai forever. I love seeing your ordered areas, and all the tools/scissors up on the board. How great is Muji? It’s quite expensive in Shanghai, even though other Japanese brands aren’t… but it’s also in Melbourne so thanks for those tips on storage of patterns… the files and drawers are just the perfect size! What a lovely room! I have just finished mine and I can totally relate to the feeling of relief to have everything so organised and easy to find! I really liked your method for stashing fabric. Mine is stuffed hard into a wardrobe with shelves and I can never find anything, much less remember what I have on there without taking everything out. No comic book cartons, but I’ll think of something :). You enjoy that sunshine sewing now! Thanks, Alex! Yeah I was adamant I wanted my stuff out on display instead of being tucked away behind doors. 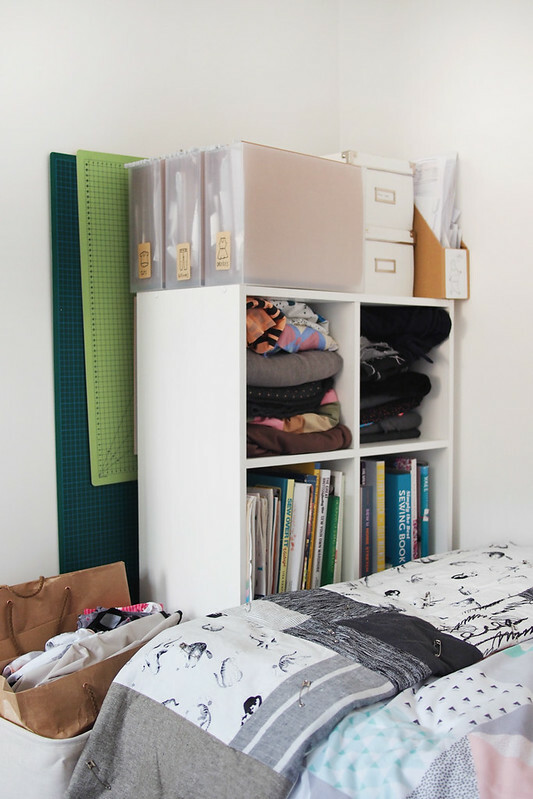 Easier to be inspired and remember what you have, AND extra impetus to keep it tidy!